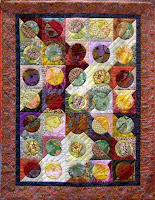 PS: If you downloaded the code for the previous quilt show buttons, you will see that it has been automatically updated to display the 2009 button - no further action required! Join us for a busy market day followed by a presentation of antique quilts and stories by collector Trish Bloomfield. Entry forms for the Sydney Quilt Show 2009 will be posted out to Guild members shortly. In the meantime, you can download the entry form (200KB PDF)to view the categories and conditions of entry. THE CLOSING DATE FOR THE RETURN OF COMPLETED ENTRY FORMS IS: FRIDAY 13 March 2009 This closing date will be strictly applied! Any queries about the entry form should be directed to the Exhibition Secretary. The Sydney Quilt Show is an exhibition of members' quilts. If you wish to exhibit in this year's show, it is not too late. Just complete a membership form and return it with your subscription payment at the same time as you send in your quilt show entry form. It is expected that all quilt show entrants will donate some time to help out at the show. Even if you have not entered a quilt, please consider submitting a volunteer form. The quilt show is a significant undertaking and a strong pool of volunteers will ensure that the team is fresh and enthusiastic to carry out important tasks such as catalogue and raffle ticket sales and white glove floor monitoring duties. Every volunteer will receive a specially minted Quilt Show 2009 badge and we have a special Sydney Quilt Show Volunteers Prize (value $350 product) sponsored by Cotton On Creations. You will be given one entry into this draw for every 2 hours duty you volunteer. Jennifer's own design, using colourful Kaffe Fassett materials in the circles and borders. The design is based on ideas presented in 'Circle Play' by Reynola Pakusich. Quilt is machine pieced and quilted. This blog post contains updated information about the forthcoming visit by American quiltmaker, lecturer and teacher, Vikki Pignatelli. If you wish to attend the lecture and/or the morning workshop (including if you have previously submitted an expression of interest), please complete this booking form and return it to the office with your payment to reserve your place. Please get your friends together and support this initiative. We can’t do it without your support! American quiltmaker, lecturer and teacher, is coming to Australia with the support of the Barbara Meredith International Tutor Trust in April and May 2009. Subject to pre-bookings, there is one workshop available [are two workshops available, but only one will be booked, the one that registers the most interest. ‘Scrap the Pattern-Improvisational Curves’, an impromptu approach to piecing curves, offering total freedom in quilt making. CATERING: Bring your own lunch, if staying for the lecture. Light refreshments available for morning tea. There are no facilities handy to the venue. A requirement list will be sent once the numbers (16) are sufficient to book the tutor. (Update: As at 6 February there are 10 bookings - the class size is capped at 20 students.) No refunds will be made after confirmation of booking the tutor has been made. You will have to find a replacement or there may be a waiting list at the office from which you can organise one.